1. In a large saucepan heat berries, nutmeg, cinnamon, sugar, lemon juice and water. 2. Boil gently until well blended and slightly cooked down. 3. In a bowl combine flour, baking powder, salt, and sugar. 4. Cut in butter and add enough milk to make a soft biscuit dough. 5. Drop by spoonfuls into hot berry sauce. 6. Cover tightly with a lid and gently boil for 15 minutes – DO NOT remove the lid while cooking otherwise the dumplings won’t rise and you’ll be stuck with a gloopy mess. 7. The dumplings should be puffed and well cooked through. Transfer cooked dumplings to serving dish. 8. 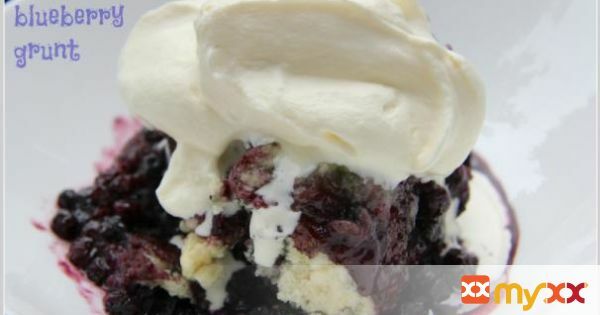 Spoon blueberry sauce over top and serve with whipped cream. 9. The Culinary Chase’s Note: This is best consumed the day it is made. Enjoy!